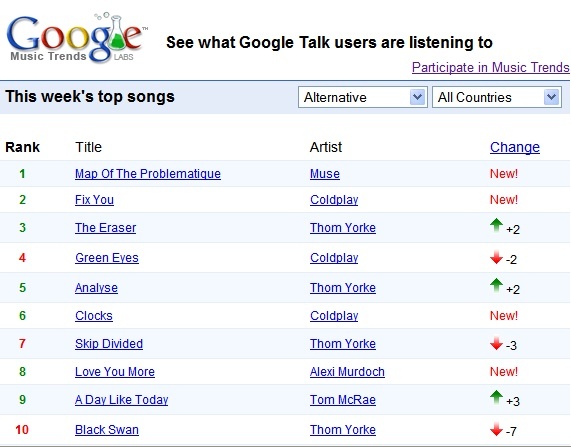 I mentioned last month about an new feature that shows the song you're listening to as a status in Google Talk. 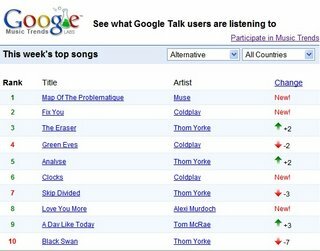 Now that Google Talk 1.0.0.96 is available to public, Google thought it's a good idea to use the songs listened by GTalk users for a new service: Google Music Trends. Every week, you'll see the most popular 20 songs by genre and by country. Currently, only US is an option in the country list. The service is integrated with Google's music search, so if you click on the artist name you'll find the latest albums and other related information. The new service is opt-in, so you need to enable it in Google Talk. Go to Settings / Audio and check "Share music listening history with Google Music Trends". Another interesting side effect is that all the songs played will be included in the Search History, so you can see what you listened last week or how many times you listened to U2. Of course, to record that information, you need to use Google Talk and show the current music track in the status. A similar ranking can be seen on last.fm, the site that uses plug-ins for music players to send information about the listened songs. The site also shows artist charts, top tracks for an artist and much more. But remember that popularity isn't a measure of value. How can they track the music we are listening to ? They don't specify any MP3 player GTalk is compatible with ... Does it mean they can track all of them, may be by looking at the file-system level which files are read ? They support Winamp, Windows Media Player, iTunes, Yahoo Music. How can they track the music we are listening to? Each player has an API you can use to get information like the current song. For another great example of API usage, see Foxytunes, a Firefox extension that allows you to control your favorite media players from the browser. Is this oportunity only for US citisense or something? Google Music Trends is no longer available. We're sad to have to report that Google Music Trends is being deactivated. The project has been run as a volunteer effort, and this could only last so long. Thanks to all for your input, hope we'll meet again! aye! why the heck! i'll volunteer for keeping it running. . . think.. it could give a tough competition to the Billboard top 10.. seriously. Well,I use foobar to listening to music. but i can not see what i am listening to on google talk, as this does not support foobar apparently. Any suggestions?